Kieran Harnett is a professional photographer and one-half of this fascinating idea. He meets me at one of the project’s sites on the UCD campus in Belfield, the source of their D4 jars. I first ask him if he has any plans to make this a full-time pursuit; “You’re never going to pay your mortgage keeping bees. It’s something you do for the love.” And he clearly does have a great affection for it, as well as the bees themselves. He refers to each one we encounter as a ‘she’ or ‘her’, whereas I’m still using ’it’. As he starts to open the first hive, he takes enormous care not to injure or roll any of the insects. He’s even reluctant to use a smoker; “Well, you wouldn’t like it if anyone pumped your house full of smoke, would you?”. I have to concede that I wouldn’t, despite knowing that they would likely be a lot more docile if he did use it. It amazes me that such a small change can influence a population of fifty thousand creatures so profoundly. I wonder if there’s any chance two queens can be in the hive at the same time; “It’s a bit like Highlander: There Can Be Only One! It’s how the colonies multiply. When a new queen matures, the old queen swarms and takes the workers with her to form a new hive, leaving the new queen to populate the old hive”. That swarm used to settle in the hole of an old tree, safe from predators like bears and badgers. But that’s an increasingly rare environment, so now they often end up in the roofs of people’s houses. When that happens, they can come into conflict with humans. 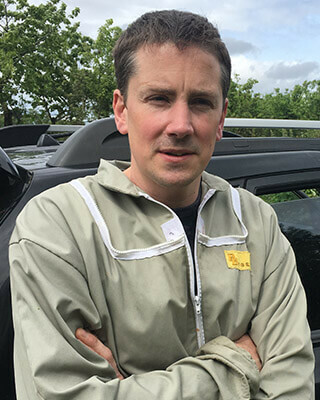 But with people more aware than ever of the importance of bees to our planet’s biodiversity, Kieran often gets a call to come and safely remove the hive. When he does so, he takes the honeycomb form this natural hive and grafts it in on to a new human-made frame, creating yet another honey factory to add to his collection. We take a closer look at the honeycomb and some cells are stuffed with plant pollen in a variety of different colours; orange for dandelion, pinky-blue for launder and a cerise pink for horse-chestnut. Kieran explains how different postcodes have different plant profiles, which in turn give a different taste to their honey. 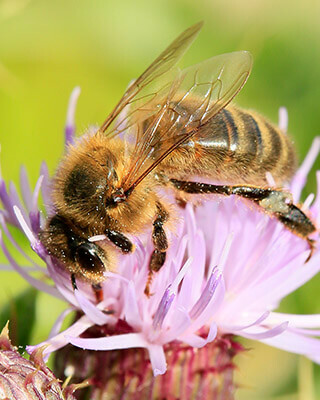 City centre locations mostly consist of pollen and nectar from Lime trees, whereas the outer suburbs contain a wider variety of garden plants, giving the honey a more complex taste. 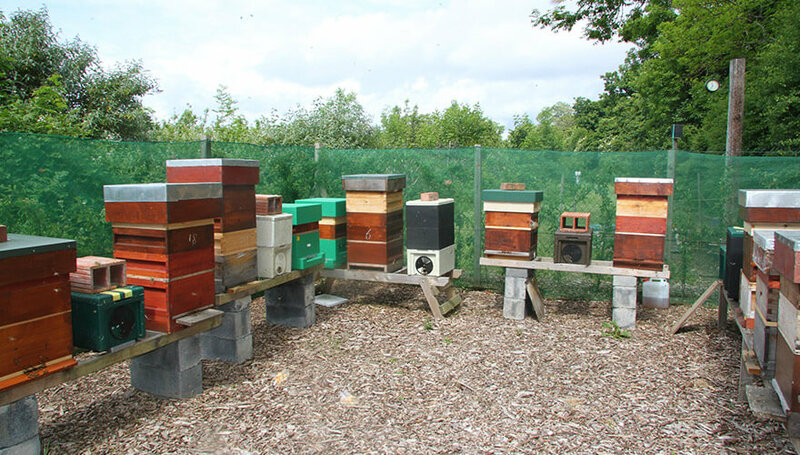 It’s those more varied honeys that tend to do well in competitions. As Kieran gets his first sting of the day, the hum of the bees audibly increases by a semitone and doubles in volume. They’re landing all over me and I’m fighting the urge to high-tail it out of there, bee suit or no. Kieran explains what’s happened; “A bee has to be pretty sure you’re a threat before she stings as it means her death. Her sisters can smell the sting and are reacting with a heightened aggression.” He pumps a little smoke over the sting and the colony seems to calm down a little, no longer able to detect what’s going on. They really feel like a single organism rather than a group of individuals. Kieran got into beekeeping because of an interest in food origins. He also keeps chickens and has an allotment where he grows vegetables. But honey production is hugely weather dependant. 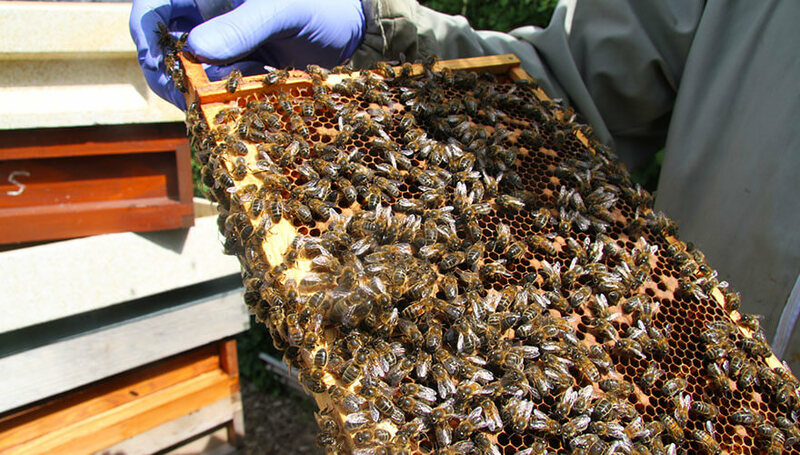 A single hive can yield anywhere between ten and seventy pounds a year. It’s all down to how much sunshine and how little rain we get. Again, not exactly something you can rely on for a living. But he and his friend, Gearóid Carvill, have developed a product that is truly unique to Dublin. I hope one day we get to see that pyramid in my local shop with every postcode in the city. Until then, I’m looking forward to August when we’re likely to see these beautiful jars adorning our shelves once more. And this time I’m going to buy every postcode I can.